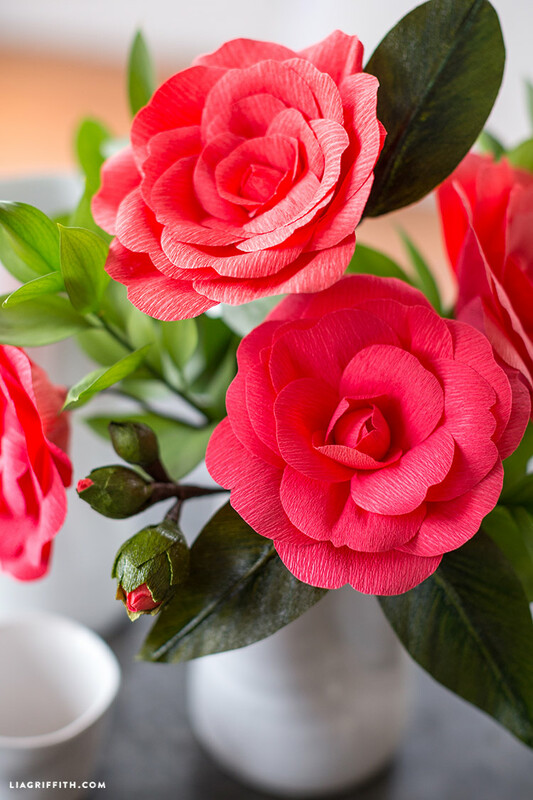 A stunning new crepe paper flower masterpiece you’ll fall in love with… Our crepe paper camellia is a project made in paper crafting heaven! 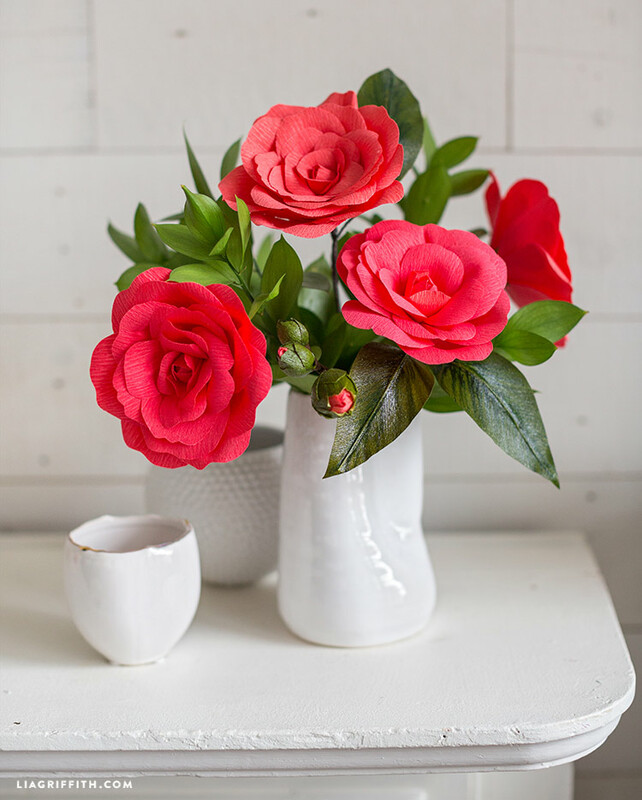 Featuring our double-sided crepe from our online shop in Strawberry + Tulip and Ferns + Moss, the two-toned nature of these blooms make for an extra artful appearance. 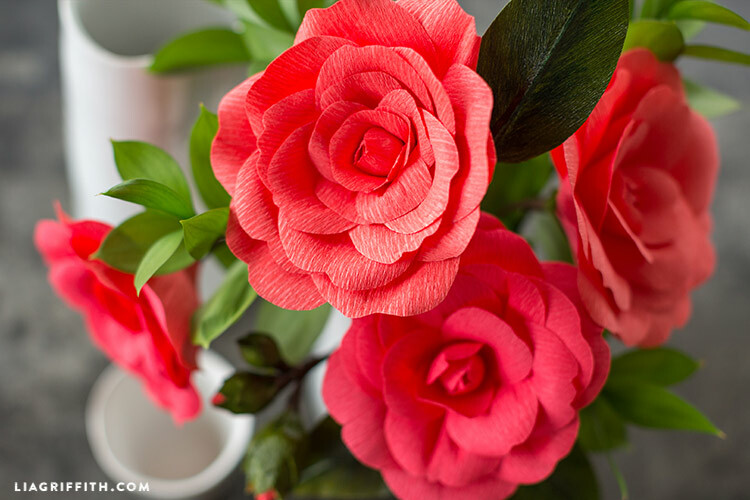 We paired our finished camellia flowers and buds with some real fresh greens which bring these blooms to life. 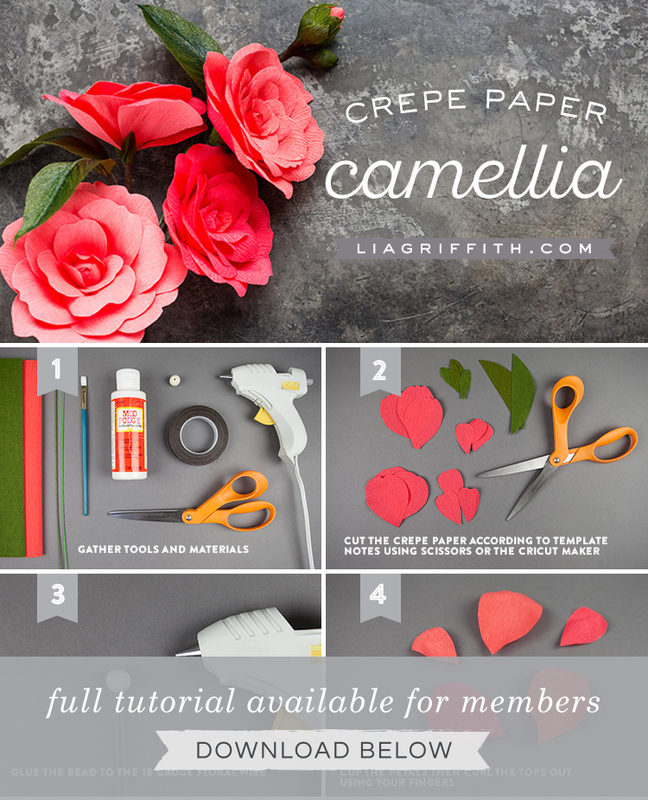 Cut the crepe paper according to template notes using scissors or the Cricut Maker. Glue the bead to the 18-gauge floral wire. Cup the petals then curl the tops out using your fingers. Join the crepe paper revival! 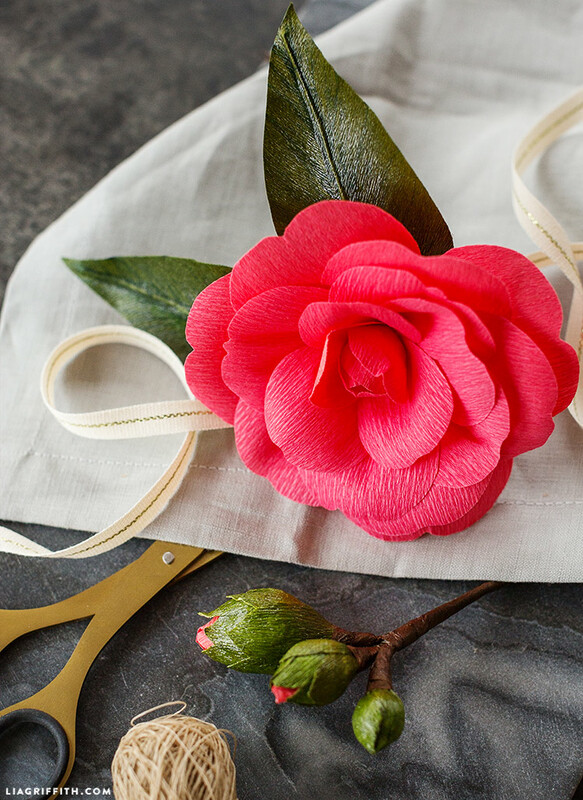 Craft a whole garden of crepe paper flowers with hundreds of other projects… Browse here. Desperately trying to cut these with the Maker – but running into issues with the rotary blade dragging through and destroying the Lia Griffith brand double-sided crepe paper. I’ve used setting “crepe paper” and “tissue paper” both with same results. Any suggestions on what setting works best? Cricut’s response is to “try different settings” but Id like not to destroy my mats and stock of very fine crepe paper. If the rotary blade is dragging that may be the problem. It should be rolling. It may be the blade is stuck. Do you have an extra rotary blade you can try. Hi! The rotary blade should NOT be dragging– if that’s the case, it sounds like an issue with the machine/blade. When first got our Maker and tried the crepe paper setting, it required the Knife blade (which we didn’t have at the time), so we experimented with different fabric settings and were successful with those as they used the Rotary blade. So if you can spare a small piece of crepe, try cutting a small circle on various fabric settings to see how those work. I hope that helps! Thanks Folks! Calling cricut now – replaced the rotary blade and tried many different variables. Got it to work on one setting – but not repeatable 🙁 2nd and 3rd time it ripped through the paper and the mat surface! keeping my fingers crossed that they can fix it. Hi Sheila, you have to unzip the file that downloads from our site to extract the SVG, then upload that to Design Space. Did you click all three downloads? The “template” is a PDF– which, you’re right! It’s marked incorrectly as the Plumeria so we’ll get that corrected. But that PDF usually will open up in the browser window. The last download is the SVG file that should go directly to your Downloads folder as a .zip. How I paid your suscription, I do not have credit card. I have debit card! Do you send me another alternative, please! I likes your projects and I am very interested! 1. I asked this question a few days ago, but I can’t remember where! You may have already answered t or you may have chosen not to which I will certainly understand due to your affiliation with Cricut. I love making crepe paper flowers and think I would make more if the new Cricut Maker cuts the very fine crepe paper. I just don’t see how the fine paper wouldn’t stretch when taking it off the pad. I have a Cricut air which works fine for paper and I would hate to spend the money for a new one if the Extra fine crepe paper doesn’t work well on it. 2. When you use the Pelion to make double sided paper, do you find that it doesn’t stretch as well? Thanks so much for your time. Should you choose not to respond to No. 1, no problem. Just asking a general question. Some of your tutorials (paper white) call for using tacky glue rather than hot glue. Can tacky glue be used for all your flowers? The hot glue strings drive me c-r-a-z-y! Many thanks for all you do!! How do you make the buds? Each template is different, but this one in particular is portrait.